Many homes today have been built with trusses - prefabricated structural assemblies that hold up the roof and the top floor ceilings. Trusses are a series of triangles fastened together with gusset plates. The outside members of a truss are called chords while the inner pieces are known as webs. 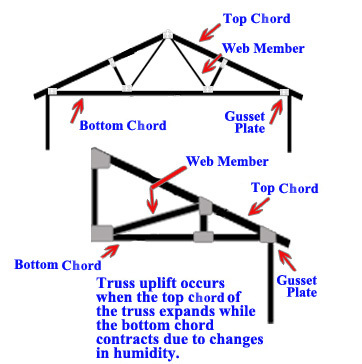 Truss uplift occurs when the top chord of the truss expands while the bottom chord contracts due to changes in humidity. Truss uplift usually becomes visible in a home during the winter when the bottom chords (the ceiling joist part of the truss), which are buried under ceiling insulation, stay warm and dry but the top chords are exposed to moisture. The resulting stress causes the truss to lift up at its center. When this happens, a crack can appear at the wall/ceiling juncture. From a structural standpoint, truss uplift isn’t a problem, but cosmetically, it can cause cracks and separations in the drywall. Many homeowners try to repair the cracks with drywall compound, only to have them reappear next year. Contractors can mask truss uplift by securing the ceiling drywall to the top of the interior walls and not the trusses for 18 inches away from the interior walls. As the drywall flexes, it stays fastened to the walls while the trusses lift above it. Decorative molding can also be installed where the walls meet the ceilings. The molding should be fastened to the ceilings, not to the walls so as the ceiling move up, so does the molding thereby hiding the gap.